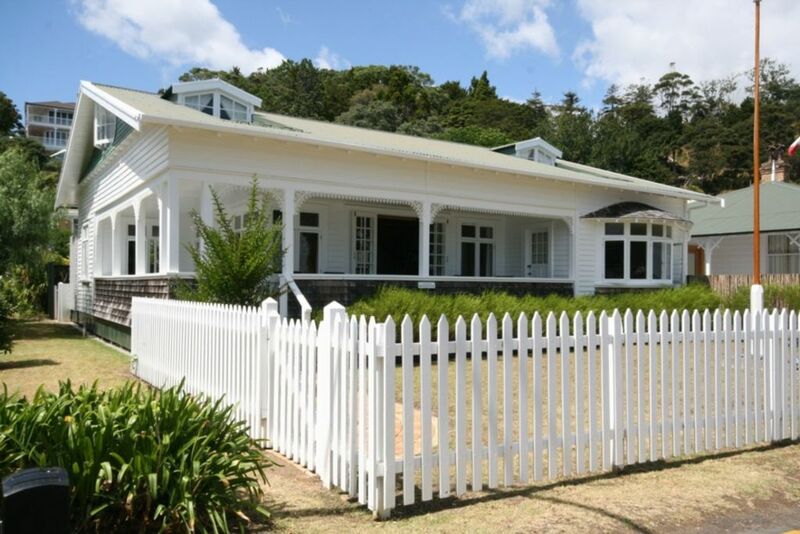 Beachside is a private Waterfront House situated on the historic Russell waterfront with exceptional views of the wharf and the colourful Russell anchorage wit hviews spanning across the bay to Paihia and Waitangi. The house is self catering with a large farm house and kitchen dining area, full oven, range hood, microwave, fridge freezer, etc, the lounge is large and spacious, access to the wrap around covered deck is by french doors, sit on the outdoor furniture overlooking the waterfront and relax with a glass of wine and enjoy the stunning sunsets... FREE WIFI! The master bedroom has a large lounge area for that little bit of extra seclusion, a large bay window features a table and chair for the artist or writer in you? The twin bedroom is at the back of the house and is bathed in the morning sun, it has 2 single beds (these can be pushed together) if required. There is 1 bathroom with a shower, full bath, toilet and vanity, there is an additional toilet in the outside laundry area. Beachside has a mooring to accommodate a vessel of up to 60 feet in length overall, by arrangement. There is a BBQ in sunny private courtyard with outdoor furniture, a secured and gated lawn area can also accommodate a boat. Please note: For your comfort the house is pet free and is non-smoking property. For your comfort the house is pet free and is non-smoking property. A booking fee of $50.00 applies to all bookings. We had such a lovely time in this beautiful house. Lesley & Barry were top notch. Fully recommend this place. Excellent guests, thanks for leaving the house tidy, really appreciated, take care. We loved this place! We were a family of six with three kids aged 11, 12 and 13. We stayed in the property for seven nights in January 2019. The location of the property was great. Close to restaurants but far enough not to be disturbed by anyone. Just across the road from the beach so we could watch the kids from the verandah. Lovely view. Kitchen was very functional and the house had plenty of room. Extra toilet was great. I would definitely stay here again. Lovely Bach, perfect location , but only one bathroom may put some people off. Stunning spot and a superb house. Excellent property. Comfortable, clean and tidy. Has everything you need. We didn't use the car at all which was bliss. A short stroll from the restaurants and such a beautiful outlook to the sea and the rising sun each day. Pure bliss!